Just few days, dap-news.com, a popular news website in Cambodia is blocked by Mozilla if you use firefox or Google chrom. The mozilla uses advisory provided by google for Safe Browsing. What is the current listing status for dap-news.com? Of the 13 pages we tested on the site over the past 90 days, 2 page(s) resulted in malicious software being downloaded and installed without user consent. The last time Google visited this site was on 2011-06-07, and the last time suspicious content was found on this site was on 2011-06-06.Malicious software is hosted on 1 domain(s), including infoitpoweringgatheringit.com/. 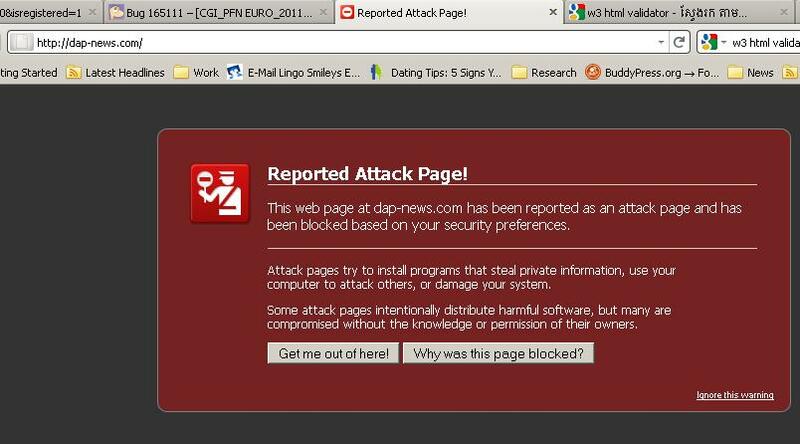 As network, through dap-news.com, it can harm our computer, it can steel our privacy information such as user login, credit card or more because those listed sites are served content that resulted in malicious software being downloaded and installed without user consent. dap-news.com’s owner need to take care about this otherwise he will harm his audiences. Normally this warning appears after the attack found, how about the time before the warning? The website development company need to control their code and quickly solve the issue. Hope they will resolve them soon.